In the early 1960s, Percy White III lived on a farm in Dinwiddie County, Virginia with his grandparents, his parents, and his two sisters. The house had no electricity and no running water. To get water, Percy’s family had to carry it from a nearby creek. The land they lived on wasn’t theirs; it was owned by a man named Robert Marek, who people called Mr. Marks. Percy’s family worked the fields. Percy came to StoryCorps with his friend Terry Wright, where he shared what life on the farm was like. Top Photo: Percy White III is held by his father, Percy White, Jr, circa 1963. Courtesy of Percy White III. 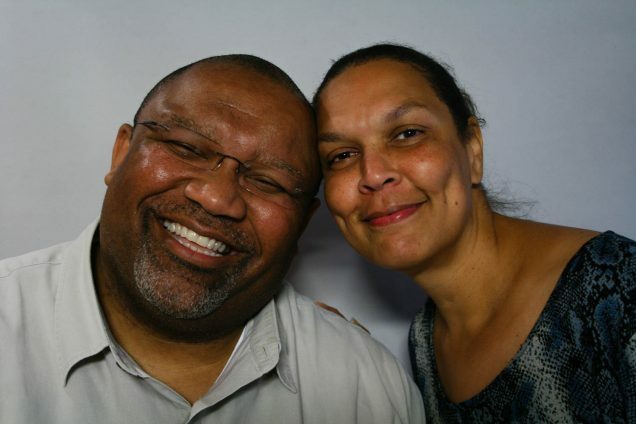 Bottom Photo: Percy Ell White III and his friend Terry Wright at their StoryCorps interview on October 7, 2012 in Arlington, Virginia. By Erin Dickey for StoryCorps. Originally aired August 3, 2018, on NPR’s Morning Edition. PW: My parents were sharecroppers, working the land, working the tobacco, pulling the little bloom that comes off so there’d be more leaves. They would put the tobacco in a barn, hang it up, and they would have a low-burning flame in there. But there has to be somebody in there to maintain the flames so it doesn’t go out. TW: All through the night? PW: All through the night. PW: And my father would have to do that. But anyway, by the time they got to market, Mr. Marks would always come up with something. ’Well, you know, you broke that axe. So I got to charge you for the axe.’ ’There was gas used for the tractor, I got to charge you for the gas.’ So by the time he subtracted all of these many things from all of the work that my family had done, they would get literally just a couple of dollars! While Mr. Marks and his family – a white man – they were doing pretty well. My father got upset and told Mr. Marks, ’I’m taking my family, and we’re moving up North.’ Mr. Marks told my father, ’Well, you can go up there! But you not going to get a job! You didn’t finish high school. What are you going to do? You’ll be back here in no time.’ My father did a very hard thing, in my opinion. He left his mother, went up to D.C., and got a job. He worked with The Washington Star newspaper as a janitor and worked his way up to a supervisor. My father, he was getting older, and he asked me to drive him and my family down to Dinwiddie County to see Mr. Marks. Mr. Marks had long since died, but Mrs. Marks was there. There was a great deal of pride in my father’s face to tell her that. Because he felt like he could say, ’See, I told you I was going to do well.’ And him doing well was through his children. It’s hard to explain how powerfully that sticks with me. Mandy Cooke tells Paula Reed about her enduring trauma from the 1999 Columbine High School shooting, which both women survived. Siblings Lauren Cartaya and Zach Cartaya remember how the 1999 Columbine High School shooting changed their lives forever. Dee Westenhauser speaks to her childhood friend, Martha Gonzalez, about the one person in her life who saw her for who she truly was. Copyright © 2003-2019 StoryCorps, Inc. All rights reserved.